Don’t let the name fool you. MobilBet is an excellent sports betting site regardless of whether you want to bet from a mobile device or from a more traditional computer. Of course, it will work great with smartphone and tablets (both Android and iOS devices), but MobilBet is top-notch for old-fashion computer betting as well. You use the same log in information regardless of device type. MobilBet is owned by Malta-based Co-Gaming Limited. MobilBet OSCasino and Sportsbook are offered with a Curacao gambling license. Casino games delivered by the game developers NetEnt, Microgaming and Play ‘n Go fall under gambling licenses from Malta. When you sing-up with MobilBet, you get a €10 welcome bonus without having to deposit any money first. If your first deposit to MobilBet is exactly €20 you get a 150% bonus, i.e. you get €30 in bonus money. If your first deposit to MobilBet is more than €20 you get a 100% bonus up to a maximum of €300. You also receive 25 free spins that you can use in the MobileBet Casino. For all three bonus offers, it’s up to you if you want to use your bonus money for sports betting or casino games or a combination of both. MobilBet has a loyalty program where you can collect loyalty points and exchange them for bonus money or MobilBet Shop products. MobileBet has a great odd offer that is both wide and deep. For some sports (including football and ice hockey), it goes all the way down to the minor leagues and the junior contests. MMA is another example of a field where MobilBet is exceptionally good and offers odds on more than just the super famous events. Sometimes, MobileBet will even offer odds on athlete transfers. In addition to betting on sport events at MobilBet, you can bet on TV-shows, major awards and political elections. MobilBet is a great choice for anyone interested in live betting, regardless of whether you want to bet from your computer or from a mobile device. Live betting is offered for a wide range of sports. Examples of sports where the offer tend to be especially large (and deep) are association football, baseball, basket, ice hockey and tennis. MobilBet offers support by phone (call-back service), email and live chat. To get phone support, send a message to the support by email or live chat and ask them to call you. This way, you don’t have to pay for the phone call. The email address is support@mobilbet.com. For live chat support, click on the live chat link on the MobilBet site. 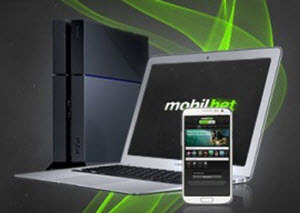 MobilBet has a traditional online casino, two live online casinos and a big mobile casino. The traditional online casino is filled with games from quite a vast array of game developers, including Net Entertainment (NetEnt), Microgaming, Play ‘n GO, Playtech, Quickspin, Blueberi, and NextGen. In the mobile casino, a majority of the games come from NetEnt or Microgaming. One of the live casinos are run by NetEnt, while the other is run by Evolution Gaming. Examples of live dealer table games available at MobilBet are Live Dealer Roulette, Live Dealer Blackjack, Live Dealer Baccarat and Live Dealer Casino Hold’em.